William Blake (1757-1827) regarded John Milton’s Paradise Lost as an important English epic poem. Twice he was commissioned to illustrate it, applying his own unique interpretation to the text. This is the full-scale colour facsimile of Satan, Sin, and Death: Satan Comes to the Gates of Hell, which Blake completed in 1806. 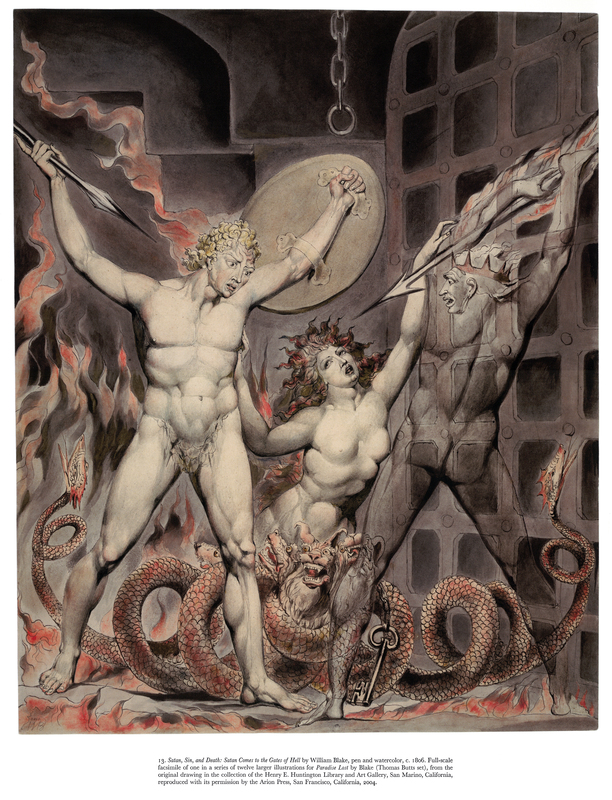 This Arion Press publication of 2004 also contains the first series of 12 images commissioned by Joseph Thomas in 1807, including another watercolour of Satan, Sin, and Death: Satan Comes to the Gates of Hell that differs slightly from the image here. This limited edition publication – no. 29 of 400 copies – is a significant addition to the materials already held in Special Collections of this important British artist-poet. William Blake, “&lsquo;Satan, Sin, and Death: Satan Comes to the Gates of Hell&rsquo; from Thirteen Watercolor Drawings by William Blake illustrating Paradise Lost by John Milton,” ourheritage.ac.nz | OUR Heritage, accessed April 22, 2019, http://otago.ourheritage.ac.nz/items/show/8312.